It is something most BVB fans didn’t fancy ahead of the new Bundesliga season. After all, the Black and Yellows had just been through a turbulent 2017/18, in which they witnessed a managerial change, poor results, uninspiring football, and the mid-season departure of Pierre-Emerick Aubameyang under dramatic circumstances. But now, under the leadership of new coach Lucien Favre, Borussia Dortmund are three points clear at the top of Bundesliga, and top of their Champions League group as well. More than anything, they are back to being one of the most exciting and entertaining clubs in the world. It has been a while since there has been such type of positive atmosphere at the Signal Iduna Park. Whether it’s lack of results or the constant departure of key players, there has always been something to dampen the mood around BVB in the last couple of years. The last two seasons of Jürgen Klopp’s era were underwhelming, and despite a bright start to his BVB adventure, Thomas Tuchel’s two-year stay was filled with unwanted headlines, and the two Peters didn’t have the best of times managing the second biggest club in Germany either. For the first time in five years, BVB look like the real deal. Since their Bundesliga triumph in 2012, Dortmund have finished 25 points, 19 points, 33 points, 10 points, 18 points, and 29 points behind Bayern, respectively, over the past six seasons. However, today, under Lucien Favre, that gap in quality has seemingly disappeared, for the time being at least. Make no mistake, this is a team capable of challenging Bayern for the league title and a team that can go far in the Champions League as well. The man behind this positivity, Favre, is getting lots of praise and rightly so. But as much as his leadership and organizational skills have been important in BVB’s good run of form, the club’s transfer activity has also been spot on. The Black and Yellows have managed to acquire young defenders like Abdou Diallo, Achraf Hakimi, and Manuel Akanji (who joined in January), replacing aging and ineffective players like Sokratis Papastathopoulos and Neven Subotić, who had been riding a downward spiral of form in recent seasons. Perhaps the most dramatic change at BVB occurred in midfield. Axel Witsel and Thomas Delaney are not only massive upgrades on the likes of Gonzalo Castro and Nuri Şahin, but they are also players who can lead the team for years to come. Upfront, BVB have hit the jackpot with Paco Alcácer. Barcelona’s unwanted man has hit top form after coming to Germany. The striker has taken 12 shots on target for his club and country, converting all but one of them into goals. On the wing, Jadon Sancho is attracting plenty of attention after his blistering start to the season. The 18-year-old is Dortmund’s main assist provider despite starting most of the games on the bench. Last but not least, you have the face of the club, Marco Reus. BVB’s captain is absolutely loving his time under Favre, who he worked with at Gladbach. The 29-year-old is singing the praise of his manager every chance he gets. With so many good things happening at Dortmund, one must wonder if they can keep this red-hot form up for so long. It would be silly to expect Bayern to get stuck in their poor form for long. The Bavarians know how to come back from set backs. You would also wonder how many more dramatic comebacks, like the ones against Bayer Leverkusen and Augsburg, do Dortmund have in their tank. At the same time, the energy and quality in this Dortmund team is good news for everyone who have been craving for a title race in the Bundesliga. On top of that, the Black and Yellows have a manager who is a master at stability and long term success. 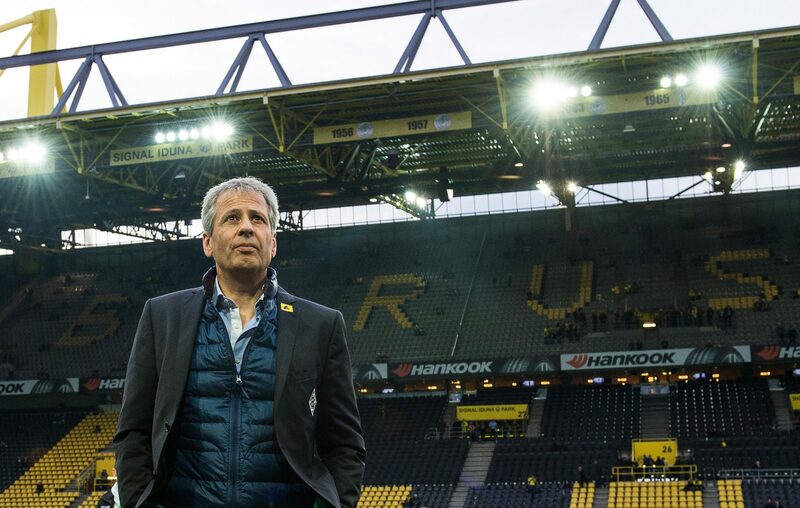 Lucien Favre is bringing the good old days back to Dortmund, but whether this good form can be maintained and translated into tangible success remains to be seen.